Since 1963 AAMCO centers have serviced over 20 million transmissions. AAMCO Transmissions and Total Car Care of Albuquerque technicians are the best trained in the industry with not only 20 years experience on new cars but also over 50 years experience in the automotive industry. Our goal is not only to provide the best product in the industry but also the best customer service available. 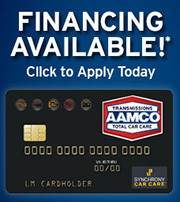 At AAMCO of Albuquerque we believe that getting the best value for your dollar is the most important part of any repair. That is why all of our services come with a minimum of a one year warranty and not the typical 90 days provided by most repair shops. We use only the highest quality parts available. AAMCO of Albuquerque is a full-service auto repair and preventive maintenance center. We are automatic and manual transmission experts. We provide transmission service and maintenance as well as transmission flush & filter service. We are conveniently located for your service and maintenance needs and we are qualified to repair and service all domestic and imported cars, trucks, and SUV's using parts that are equal to or exceed the standards of those parts originally used by the manufacturers. We are definitely the cost-effective alternative to car dealership servicing for all scheduled maintenance of your personal or company auto, pickup or truck. Regardless of where it was built, we will service your car or truck and still maintain the manufacturer's warranty. We honor most extended warranties. AAMCO of Albuquerque is independently owned and operated. We pride ourselves on getting the services or repairs on your auto right the first time by our highly qualified service technicians. So drop your auto, SUV, or truck off today and allow us to provide you with excellent service. We look forward to servicing your vehicle.